Solution: Hot and spicy foods contain molecules that stimulate paindetecting nerve endings. 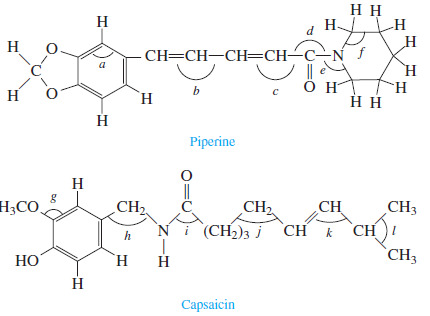 Two such molecules are piperine and capsaicin:Piperine is the active compound in white and black pepper, and capsaicin is the active compound in chili peppers. The ring structures in piperine and capsaicin are shorthand notation. Each point where lines meet represents a carbon atom.a. Complete the Lewis structure for piperine and capsaicin, showing all lone pairs of electrons. Piperine is the active compound in white and black pepper, and capsaicin is the active compound in chili peppers. The ring structures in piperine and capsaicin are shorthand notation. Each point where lines meet represents a carbon atom. a. Complete the Lewis structure for piperine and capsaicin, showing all lone pairs of electrons.